Synopsis: With war devastating the Kingdom of Vlydyn, Prince Aarian puts his personal desires aside for the good of his country. Abandoning any hope of a lifetime with his childhood love, Aarian agrees to marry an elven princess. The union, while purely political, will bring a lasting peace between humyns and high elves. Not everyone desires peace, however, including a dark elven leader willing to sacrifice his own immortality to stop the marriage. Calling forth a demonic army to destroy Vlydyn’s capital city, the dark elf unleashes a force that threatens the humyns' very existence. 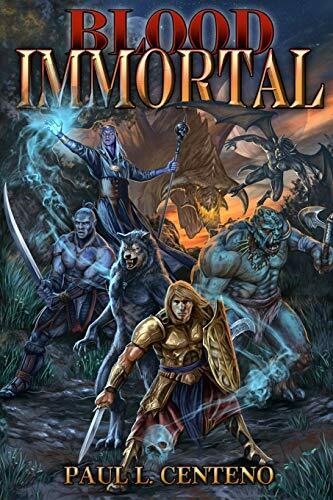 To save what little remains of his people, Aarian must turn to the most despised and feared races for aid—orcs, trolls, gargoyles, and werewolves. To win their loyalty, he will need to embrace their savage beliefs and become the Dralekar, their prophesized hero. If he can do this, Aarian will command the one army capable of ending the demonic threat before it overwhelms the world. Award-winning author Paul L. Centeno was born and raised in New York City. He wrote twelve short stories as a teenager before studying at Herbert H. Lehman College, where he earned a BA in philosophy and creative writing. After graduation, he continued to hone his writing skills while working with Gabriel Packard, associate director of the Creative Writing MFA program at Hunter College. In 2012, Centeno published two novels: Red Nova and The Vagrant Chronicle. Of the latter, Kirkus review stated, “Centeno yearns to create something completely new, and if we immerse ourselves in his cosmos, we will be richly rewarded.” In 2014, his short story Steamwalker won an award from Writers of the Future. Centeno currently resides in Waterbury, Connecticut, with his wife. At present, he is working on his sixth novel.